Natural handcrafted elephant incense box made from a strong and durable Indian rosewood with a beautifully hand carved detail and an eye-catching elephant brass inlay to the sides, ideal for catching the ash and makes burning your incense much cleaner and safer, with less mess on the tables etc. Defuses the incense fragrance and smoke through the carved holes on the top. this elephant incense burner box will hold 2 incense cones and 2 incense sticks, with this carved wooden incense box you can burn two, cones or two sticks at the same time (ideal for larger rooms and areas, or if you just like a stronger fragarnce). Comes with a convenient storage compartment at the bottom to store your sticks. 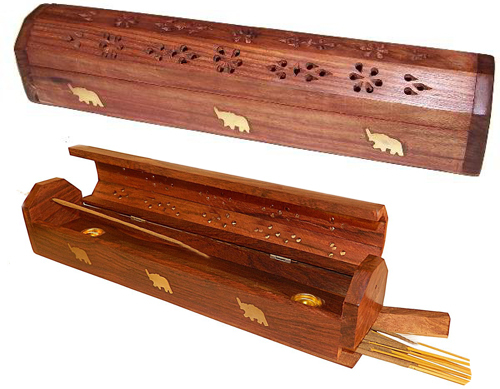 To use your incense burner box: simply place your incense cones on the two brass pots, or light your incense sticks and put them into the holes on the sides and close the lid (can also be used with the lid open).